A baseball cap is a soft hat that consists of a soft fabric crown sewn of several sections of fabric and a visor that protects the eyes from the sun. Some special order caps are made to fit the wearer in specific sizes, but most of the mass-produced models have a plastic extender in the center back that can be make bigger or smaller according to the wearer's needs. A fabric-covered button sits on the top of the crown where all the fabric sections converge. Team logos may be embroidered on the center front of the crown, or the letters associated with the team may be applied on center front. Baseball team uniforms, whether amateur or professional, always include baseball caps. They help identify players on the field and are essential in order to keep the sun from players' eyes. There are currently two different styles of caps available today. One which has a rather tall, boxy crown and is often horizontally striped (the "old style" cap still popular with those who love the traditions of the game) or the conventional soft crown of six or eight triangular-shaped sections of fabric. Interestingly, most baseball cap manufacturers still make baseball caps in wool, as they have for over a century, as well as more easily washed fabrics such as cotton or cotton-synthetic combinations. An ancestor of the game we know as baseball was familiar to some in the 1700s. Called "base ball," both the British and the Americans knew of a game with sticks and balls. Soldiers during the American Revolution played a game similar to baseball. A game called rounders, which was not too dissimilar from the game we know as baseball, was popular in Great Britain and the New World in the early 1800s, however the runner was considered "out" if they were physically hit with the ball. As early as the 1840s, amateur teams were formulated in the East Coast; during the Civil War, when New York and New Jersey soldiers shared their understanding of the game, a "national style" of baseball was established. Baseball, as we know it today, was played just after the American Civil War. From the beginning of the development of amateur teams after the Civil War, the baseball uniform was considered an extremely important part of the game. Players and managers understood that the uniforms imparted the team members with a sense of pride, legitimized this new game of baseball much as police uniforms help sanction the work of policemen, and imbued the team members with a sense of camaraderie. Photographs of teams from the later nineteenth century shows each member of the team proudly wearing matching uniforms including the baseball cap. Catalogs of sports equipment from the 1880s show baseball uniforms that include the shirt, the trousers, and the cap. Three different styles of caps are featured in these catalogs. A boxy cap made from horizontal strips of fabric was referred to as the college cap. A conventional triangular-sectioned cap with a front visor was called the Boston cap, and a soft crown cap, resembling a rain hat, with a brim running all the way around the hat was called the base ball hat. The sectional cap we know as the baseball cap resembles other soft sports caps popular in the 1800s and may be a variation of the yachting cap or a generic outdoor sport cap. These soft outdoor sports caps shielded the eyes, were relatively easily washed (were easier to wash than stiffened and blocked wool felt derbies), were popular throughout the early twentieth century, and remain relatively unchanged today. 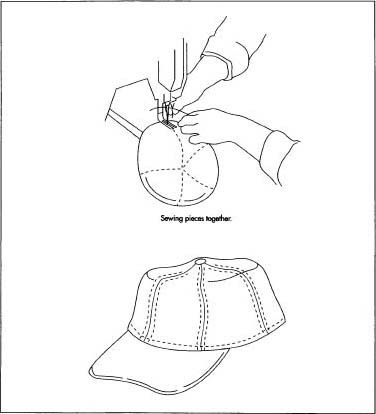 However, today the baseball cap can be adjustable or made-to-order. Baseball caps are still often made of solid-color wool. Some caps not used expressly for baseball, but are of the baseball cap style and have company or other logos on them are of cotton or cotton-synthetic combinations. The visors of these caps always include some kind of stiffening. Sometimes this stiffening is buckram, other times it is a plastic insert (the material depends on the company). Some caps are stiffened in center front to accommodate the embroidered logo and this may be accomplished by sewing various kinds of stiffeners in the two front panels. Sweatbands may be cotton or even thin leather depending on the company or product. Because the design of baseball caps has varied little, the design often changes only in the color of fabric used for the hat (based on the needs of the team) and the logo on the center front of the hat. Some companies have tinkered with the basic baseball cap design in order to get a better-fitting cap on the head (one company reduced the sections of the soft crown from eight to six sections for a better fit). Still others experiment with the insert into the visor in order to render the visor flexible but sturdy. Elaborately embroidered logos, some of which include over 30,000 stitches in order to produce the logo, are carefully designed with the aid of a computer in order to perfectly and consistently sew that logo onto the front of the caps. Interestingly, a few companies actually reproduce old-style baseball caps that were popular over 100 years ago. These companies cannot take apart the old caps in order to draft a prototype pattern (sometimes of plain cardboard) but must work from whole pieces that are visually examined and measured in order to make these patterns. The fabric layers—wool, cotton, or a cotton-synthetic mix (depending on the company and the style of hat)—are cut. Many dozens of layers of fabric are carefully laid on top of each other, and then they are cut at once using a fabric-cutting saw. Some cap designs require a mesh inner layer behind the two front panels. This mesh acts as a stiffener in these front panels in order for them to stand up to the stitching requirements of the embroidered logo. The mesh is put against the back of the panels before the panels are sewn to one another. 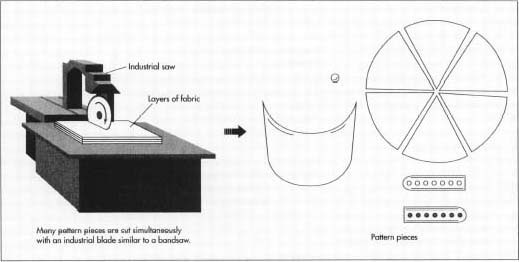 The sections of the soft crown, generally of long triangular shaped gores, are sent to the eyelet department where a machine pierces each panel creating a small hole and binding the hole completely with thread. The number of eyelets in each gore or section of crown varies according to the manufacturer, however there is at least one eyelet in each section but may be as many as forty or fifty in total. These eyelets serve as vents so the perspiration and heat that builds up under the cap can be released through the eyelets. The two front panels that are to receive embroidery are then sent to the embroidery department. Here a computer-driven embroidery machine embroiders a logo or an entire word onto one or two of the front panels. One company reveals that these logos are very complex and precise—some logos require 8,000 stitches, others require 31,000 stitches. Still other companies apply fabric letters or other applied insignia to the front panel. A baseball cap is a soft hat that consists of a soft fabric crown sewn of several sections of fabric, a visor that protects the eyes from the sun, and a plastic extender in the center back that can adjust the size of the cap. without a visor is referred to in the industry as a "beanie." Then, these beanies are sent to the binders or the binding department at which the raw seams of the soft crown are covered or hidden with a binding tape, generally cotton, that is applied over the raw edges of the crown. This tape gives the hat a finished look (no raw edges are seen when one examines the inside of the cap) and ensures that the seams won't unravel due to hard wear, perspiration, or washing. A galvanized steel button is self-covered (covered over in the same color as the rest of the cap) and it is then applied at the dead center of the baseball cap on top of the beanie crown at the place in which all the sections of the cap converge. Those companies that offer the "one size fits all" hat will sew the adjustable plastic band in the back of the cap. Other companies that make hats to order according to head size will only sew the front sections of the cap together and will vary the size or breadth of the back cap sections according to the size required by the customer. Finally, a sweatband of some sort is sewn onto the inside of the cap. This is done on industrial grade sewing machines as well and may include placing buckram (a thick, stiff mesh fabric) behind a sweatband such as inexpensive cotton or even soft leather. A label may be added at this time as well. A label may be sewn in if needed. Some companies add different steps to ensure a superior product. For example, one company blocks and steams the finished, sewn product so that its shape is "set." They claim it renders a great, long-lasting, attractive fit. Some companies add a step in which they stitch along different edges so that fabric doesn't roll back on itself and appear unsightly. The baseball cap is sewn on an industrial grade sewing machine. The cap is now ready to be stored or shipped as needed. A remarkable number of these steps are accomplished by hand using a sewing machine. Thus, the sewing machine operative can and does notice any quality inconsistencies in the product. Of course, all raw materials are held to the standards the company requires (including color fastness-important if sportsmen are playing in the rain or are perspiring in the caps). A Century of Baseball. Macmillan Publishing Co., 1976. Goldstein, Warren. Playing for Keeps: A History of Early Baseball. Ithaca, NY: Cornell University Press, 1991. I have a specific design for a baseball cap however, I cant find anyone to create a prototype for me. Every "custom" hat place, only provides an option for a logo in the center of the front of the hat. I'm looking to have a specific design run throughout the entire hat. Do you have any suggestions?